As part of their embrace of the idea that cheap food brings in cheap people who buy cheap furniture, they’ve also discounted their roast chicken and mashed potato plate on Thursdays to $1.99. It must be said that I’ve never been compelled to try their chicken meal until now. 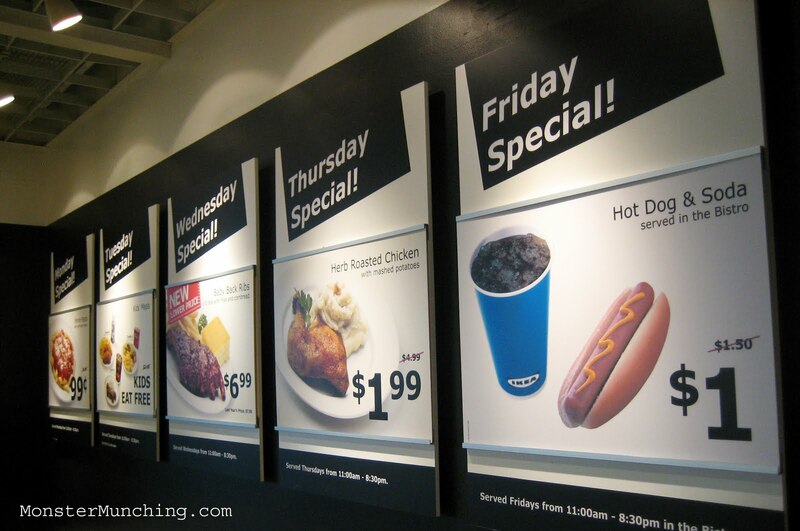 But then it must also be said that before they started discounting the breakfast from $1.99 to 99-cents, I never gave IKEA’s food much credence to be edible. The breakfast is, for the record, edible. While the eggs aren’t great (kind of curdled with a processed flavor), the potatoes are a good example of home fries and the bacon, well, it’s bacon. 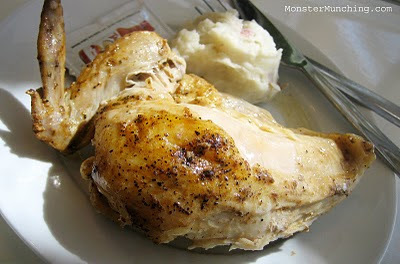 And the chicken and mashed potato dish? I can honestly report that it is the best $1.99 chicken and mashed potatoes meal I’ve ever had that isn’t deep-fried and doled out of a fast-food drive-thru. The chicken is remarkably moist and remarkably flavorful, even if the predominant flavor is salt (cue Marge Simpson’s classic line of “You might say the secret ingredient is salt!”). Before I came I actually brought a packet of Tapatio as insurance, but I never needed it. Besides, the sauce would’ve clashed with the mashed potato, which was everything mashed potato needed to be, creamy and hot, and made from what I believe are actual potatoes with bits of skin in it. It’s also nice that you can request for any cut you like (white’s the way to go here) without an up-charge. It makes you almost forget that a whole rotisserie bird at Costco, which has always retailed at around 5 bucks, is probably the better deal. Cheapness is a trait that renders you blind sometimes. "...cue Marge Simpson's classic line of 'You might say the secret ingredient is salt!'" This morning was 2 weeks in a row for me at Free Breakfast Mondays. The coffee was horrible this time. I wanted a refund...but it was free. BTW the photo of the chicken plate is just poetic. The breast is in a soft shadow amidst the blinding, dramatic twilight from those windows overlooking the 405 freeway. And that discreet package of Tapatio in the corner is hysterical. You weren't kidding when you said you brought it. If only I knew about IKEA in college! And if only this chicken deal was available then! Yep, I wasn't kidding about the Tapatio alright! Your astute eyes caught not only that but figured out where I sat! I purposely sat next to those windows to get the best light. But I got lucky with the shot. $1.99 restaurant has got competition. Love your work on Monster Munching! And I wanted to personally invite you to be one of the top cooking Advisors on ShopSquad, a free shopping advice website where shoppers and your readers can ask Advisors (i.e. you!) for advice. Don't forget their free babysitting for your 1.99 chicken dinner date night! Thanks for the generous offer, but I'm proud to have kept the content of this blog unsponsored and unbiased since its inception. Besides: if you actually read my blog you'd discover that I don't cook...much. Good luck in your venture, however! Ah yes! Completely forgot about that angle since I've not got anything to surrender there. How has it worked out for you? All comfort food, all the time. How can I resist? Sounds like the food there might be better than at one of the well known chicken fastfood restaurants. Think I'd pass on those eggs though!